A lot of people don’t realize that there’s a right way and a wrong way to get the most out of a double-hung vinyl replacement window. Aside from the obvious fact that a double-hung window tilts in for easier cleaning, which can be particularly helpful if you have a second floor of windows, there are a lot of other benefits that many people overlook. Because the top of the window can be lowered for ventilation while keeping children protected, parents may want to look at the safety benefits of double-hung windows. Kids love to climb, and hopping onto the window ledge is tempting. Keep the little ones safe and your concerns at bay by opening only the top portion of your double-hung window. Heat hovers at the ceiling. 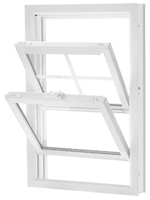 By opening your double-hung windows about three inches at the top and at the bottom, the hot air can escape out the top of the window and the cooler air can enter through the bottom. For rooms with only one window, you can put a fan in the lower portion of the window to pull the cooler air in while lowering the top of the window to circulate the warm air out. If you have blinds that lower from the top, double-hung windows allow you to maintain your privacy while still enjoying the breezy seasons. Without the benefit of eaves or overhangs, rain can come blowing through the windows on stormy days. Lowering the top of a double-hung window while you keep the bottom shut allows you to take advantage of the cool down a storm provides while protecting the sash and interior of your home. Sign up for a no-obligation in-home estimate and find out why choosing Universal Windows Direct for your next home improvement project will give you peace of mind.